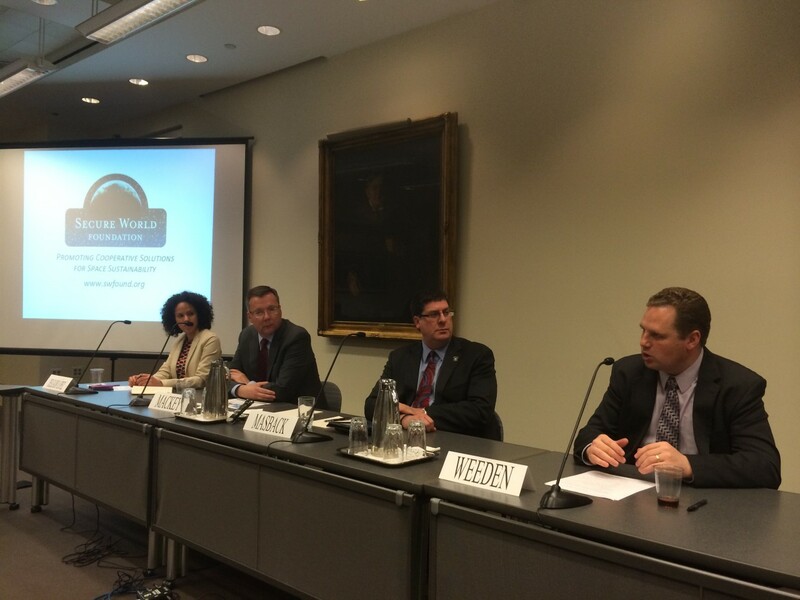 Given the prominent role satellites have played in the search for Malaysia Airlines Flight 370, on May 8, 2014, the Secure World Foundation (SWF) hosted “Beyond Malaysia Airlines Flight 370: The Evolving Role of Satellites in Aviation Safety,” a panel discussion in Washington D.C. The event, held two months after the start of the search for the missing aircraft, focused on examining the technical, operational and political challenges of this disaster, while examining how space assets play an increasing role in aviation safety. Panel convened by Secure World Foundation discussed the role of satellites in aviation safety spurred by the disappearance of Malaysian Airlines flight 370 (Credits: SWF). John Mackey, senior vice president of network operations at Inmarsat, highlighted the company’s role in aviation and maritime since its establishment as an intergovernmental organization in 1979. According to Mackey, the satellite communication provider is now “the most widely used satellite operator” in the aviation industry. Expanding on Inmarsat’s operational and safety services, Mackey discussed the ACARS (Aircraft Communications Addressing and Reporting System) and FANS (Future Air Navigation System) communications systems, which receive data via satellite to track aircraft in flight. He explained how the innovation of satellite communication in oceanic air traffic management, introduced in the 1990s, has enabled a number of efficiency benefits, including reductions in the vertical and horizontal separation between aircraft in flight. Looking to the future, Mackey said that while basic position reporting technology is well established, the ability to provide more detailed position reporting requires added capability: “higher bandwidth is what it’s all about.” He suggested that manufacturers and regulators work together towards the goal of modernizing the air traffic system, as the challenge is more regulatory and policy-driven than technical in nature. He noted that the International Civil Aviation Organization (ICAO), a specialized agency of the United Nations that works with States and other stakeholders to develop standards and recommended practices, has begun the process of examining the basics of global, real-time air traffic management. He also mentioned that Inmarsat would be offering a free service to send basic tracking data for any airline that already has Inmarsat gear. Satellite imagery of suspected MH370 debris from March 23 turned out to be a false alarm. 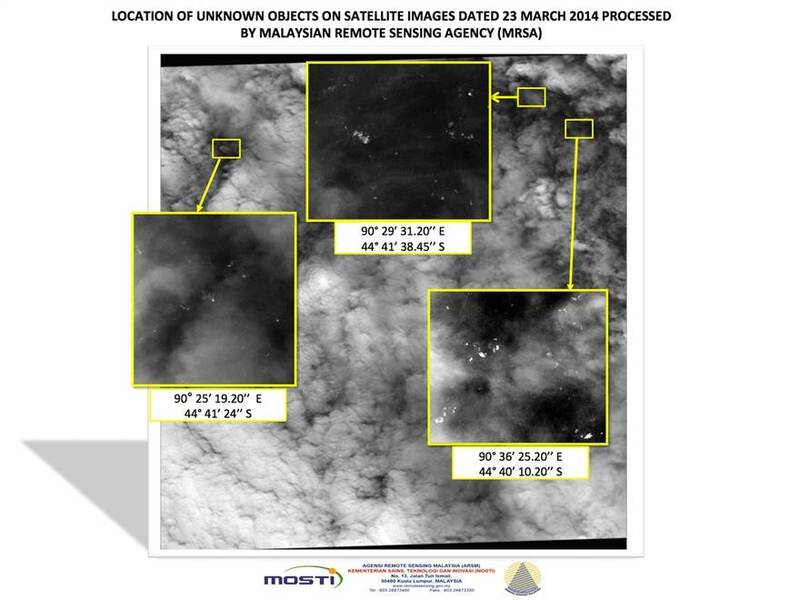 Satellites are playing a bigger role in aviation, even as they fail to shine light on the MH370 disappearance (Credits: Ministry of Transport Malaysia). Brian Weeden, technical advisor at Secure World Foundation, began by explaining that experts have differing views on what might have happened to the flight. He also said it is unclear whether national governments and their militaries have the satellite capabilities to determine exactly what happened. Divulging what they know – and do not know – would in turn reveal the extent of their capabilities. Weeden also highlighted the dual use nature of space technology and commented on how the lines of military, commercial, and civil activity are becoming increasingly blurred. This leads to complex policy challenges within the government when considering what kind of assets to use to address situations of this nature. A related issue is the geopolitics of data sharing in cases that transcend national lines. MH370 carried passengers and crew from over a dozen countries and the flight transited though a number of sovereign airspaces before likely ending in Australian waters. Meanwhile, most aviation safety and air crash investigation experts are in the United States and Europe. Given the complex international engagement required, Weeden said that trust is a major issue. This raises a series of policy questions: Who should take the lead in these situations? How and what kind of data are shared? What role does the public play? As a number of technological improvements are considered – including longer battery life for black boxes – stakeholders in the aviation field are exploring the policy and regulatory steps that might be needed to enable the modernization of the aviation system. Panelists noted that such changes would take time and that airlines might need incentives to incur the costs of updating their fleets. However, in the aftermath of MH370, there may be enough momentum to drive these changes and realize an even safer flight experience in the future. Christopher Johnson and Laura Delgado López are Project Managers for Secure World Foundation. Ms. Delgado López moderated the May 8 panel.